But relax, dear patient. Let’s apply a little Novocain to your orifice. Let’s give you a subsidy to help ease the pain you will suffer when you see the highly inflated cost of health insurance you are now commanded to purchase under threat of penalty. People making between 100 and 400 percent of federal poverty level can qualify for the premium tax credit health insurance subsidy. Federal poverty level changes every year, and is based on your income and family size. Using 2013 FPL levels, you’ll qualify as an individual with an income range of $11,490-$45,960, a couple with an income of $15,510-$62,040, and a family of three earning $19,530-$78,120. Just how do you calculate your subsidy? Your subsidy amount is the difference between your expected contribution and the cost of the benchmark plan. But just because the benchmark plan is used to calculate your subsidy doesn’t mean you have to buy the benchmark plan. You may buy any plan listed on your health insurance exchange, but your subsidy amount stays the same. If you choose a more expensive plan, you’ll pay the difference plus your expected contribution. If you choose a plan that’s cheaper than the benchmark plan, you’ll pay less since the subsidy money will cover a larger portion of the monthly premium. If you choose a plan so cheap that costs less than your subsidy, you won’t have to pay anything for health insurance. However, you won’t get the excess subsidy back. If you’re trying to save money so you choose a plan with a lower value, (like a bronze plan instead of a silver plan), you’ll likely have higher coinsurance and copays when you use your health insurance. There’s another reason to choose a silver-tier plan. There’s a different subsidy that lowers copays, coinsurance, and deductibles for some low-income people. Eligible people can use it in addition to the premium tax credit subsidy. However, it’s only available to people who choose a silver-tier plan. Your income is very close to 400 percent of FPL. Your income varies from year to year so you’re not sure how much you’ll make. When the subsidy is paid in advance, the amount of the subsidy is based on an estimate of your income for the coming year. If the estimate is wrong, the subsidy amount will be incorrect. If you earn less than estimated, the advanced subsidy will be lower than it should have been. You’ll get the rest as a tax refund. If you earn more than estimated, the government will send too much subsidy money to your health insurance company. You’ll have to pay back part or all of the excess subsidy money when you file your taxes. Even worse, if your actual income ended up more than 400 percent of FPL, you’ll have to pay back every penny of the subsidy. This could be thousands of dollars. If you get your subsidy when you file your income taxes rather than in advance, you’ll get the correct subsidy amount because you’ll know exactly how much you earned that year. You won’t have to pay any of it back. 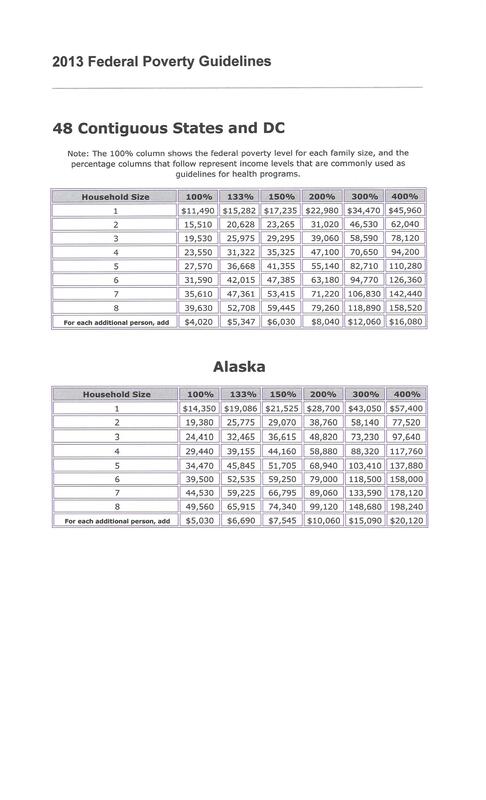 Figure out how your income compares to FPL. Find your expected contribution rate in the table below. Calculate the dollar amount you’re expected to contribute. Find your subsidy amount by subtracting your expected contribution from the cost of the benchmark plan. Mary is single with an income of $22,800 per year. FPL for 2013 is $11,490 for single people. To figure out how Mary’s income compares to FPL, use: income ÷ FPL x 100. $22,800 ÷ $11,490 x 100 = 198.4. Mary’s income is 198 percent of FPL. Using the table below, Mary is expected to contribute 4-6.3 percent of her income. Since she’s almost at the top of her category in the table, she uses the 6.3 percent figure. To calculate how much Mary is expected to contribute, use this equation: 6.3 ÷ 100 x income. 6.3 ÷ 100 x $22,800 = $1,436. Mary is expected to contribute $1,436 per year, or about $120 per month, toward the cost of her health insurance. The premium tax credit subsidy pays the rest of the cost of the benchmark health plan. The benchmark health plan at Mary’s health insurance exchange costs $3,900 per year or $325 per month. Use this equation to figure out the subsidy amount: cost of the benchmark plan – expected contribution = amount of the subsidy. $3,900 – $1,436 = $2,464. Mary’s premium tax credit subsidy will be $2,464 per year or about $205 per month. If Mary chooses the benchmark plan, or another $325 per month plan, she’ll pay $120 per month for her health insurance. If she chooses a plan costing $425 per month, she’ll pay $220 monthly for her health insurance. If she chooses a plan costing $225 per month, she’ll only pay $20 per month for her health insurance. I hope your weather is not as beautiful as it is here in my part of Texas on this Sunday afternoon. If so, you are probably regretting you took the time to get this far into this hopefully informative piece. If it is – do not blame me and certainly–do not shoot the messenger. As for me, I’m getting out on my motor bike and will take my mind off this monumental cross I bear being . . . The Healthcare.gov website requires that individuals looking for coverage enter personal information before comparing plans. IT experts believe that this requirement is causing the website to crash. A growing consensus of IT experts, outside and inside the government, have figured out a principal reason why the website for Obamacare’s federally-sponsored insurance exchange is crashing. Healthcare.gov forces you to create an account and enter detailed personal information before you can start shopping. This, in turn, creates a massive traffic bottleneck, as the government verifies your information and decides whether or not you’re eligible for subsidies. HHS bureaucrats knew this would make the website run more slowly. But they were more afraid that letting people see the underlying cost of Obamacare’s insurance plans would scare people away. As you know if you’ve been following this space, Obamacare’s bevy of mandates, regulations, taxes, and fees drives up the cost of the insurance plans that are offered under the law’s public exchanges. A Manhattan Institute analysis I helped conduct found that, on average, the cheapest plan offered in a given state, under Obamacare, will be 99 percent more expensive for men, and 62 percent more expensive for women, than the cheapest plan offered under the old system. And those disparities are even wider for healthy people. That raises an obvious question. If 50 million people are uninsured today, mainly because insurance is too expensive, why is it better to make coverage even costlier? The answer is that Obamacare wasn’t designed to help healthy people with average incomes get health insurance. It was designed to force those people to pay more for coverage, in order to subsidize insurance for people with incomes near the poverty line, and those with chronic or costly medical conditions. But the laws’ supporters and enforcers don’t want you to know that, because it would violate the President’s incessantly repeated promise that nothing would change for the people that Obamacare doesn’t directly help. If you shop for Obamacare-based coverage without knowing if you qualify for subsidies, you might be discouraged by the law’s steep costs. So, by analyzing your income first, if you qualify for heavy subsidies, the website can advertise those subsidies to you instead of just hitting you with Obamacare’s steep premiums. For example, the site could advertise plans that cost “$0″ or “$30″ instead of explaining that the plan really costs $200, and that you’re getting a subsidy of $200 or $170. But you’ll have to be at or near the poverty line to gain subsidies of that size; most people will either not qualify for a subsidy, or qualify for a small one that, net-net, doesn’t make up for the law’s cost hikes. This political objective—masking the true underlying cost of Obamacare’s insurance plans—far outweighed the operational objective of making the federal website work properly. Think about it the other way around. If the “Affordable Care Act” truly did make health insurance more affordable, there would be no need to hide these prices from the public. Comparable private-sector e-commerce sites, like eHealthInsurance.com, allow you to shop for plans and compare prices simply by entering your age and your ZIP code. After you’ve selected a plan you like, you fill out an on-line application. That substantially winnows down the number of people who rely on the site for network-intensive tasks. Jay Angoff, a former federal official at the agency that oversees the exchange, told the Journal that he was surprised by the decision. “People should be able to get quotes” without entering all of that information upfront. Weaver and Radnofsky say that the core problem stems from “the slate of registration systems [that] intersect with Oracle Identity Manager, a software component embedded in a government identity-checking system.” The main Healthcare.gov web page collects information using the CGI Group technology. Then that data is transferred to a system built by Quailty Software Services. QSS then sends data to Experian, the credit-history firm. But the key “identity management system” employed by QSS was designed by Oracle, and according to the Journal’s sources, the Oracle software isn’t playing nicely with the other information systems. Oracle hotly denies these claims. “Our software is the identical product deployed in most of the world’s most complex systems…our software is running properly,” said an Oracle spokeswoman in a statement. Henry Chao, the deputy chief information officer at CMS who made the “third world experience” comment, was told by his superiors that failure to meet the October 1 launch deadline “was not an option,” according to the Times. Think about it. It’s quite possible that much of this disaster could have been avoided if the Obama administration had been willing to be open with the public about the degree to which Obamacare escalates the cost of health insurance. If they had, then a number of the problems with the exchange’s software architecture would never have arisen. But that would require admitting that the “Affordable Care Act” was not accurately named. The White House knew that its people on the front lines, people like Henry Chao, were worried that the exchanges would get botched. They saw the Congressional Research Service memorandum detailing that the administration has missed half of the statutory deadlines assigned by the law. But they were more afraid of the P.R. disaster of disclosing Obamacare’s high premiums than they were of the P.R. disaster of crashing websites. What you see is the result. WASHINGTON — The federal health care exchange was built using 10-year-old technology that may require constant fixes and updates for the next six months and the eventual overhaul of the entire system, technology experts told USA TODAY. The site could be perfect, but if the systems from which it draws data are not up to speed, it doesn’t matter, said John Engates, chief technology officer at Rackspace, a cloud computer service provider. Recent changes have made the exchanges easier to use, but they still require clearing the computer’s cache several times, stopping a pop-up blocker, talking to people via Web chat who suggest waiting until the server is not busy, opening links in new windows and clicking on every available possibility on a page in the hopes of not receiving an error message. With those changes, it took one hour to navigate the HealthCare.gov enrollment process Wednesday. Those steps shouldn’t be necessary, experts said. AFFORDABLE CARE ACT: What does it mean for you? Outsiders acknowledged they can’t see the whole system, but they said they feared HHS built a system that will need an expensive overhaul that would cause more headaches for people trying to buy insurance. “I will be the first to tell you that the website launch was rockier than we wanted it to be,” HHS Secretary Kathleen Sebelius said Wednesday at Cincinnati State Technical and Community College, adding that people have until Dec. 15 to enroll to ensure coverage beginning Jan. 1. HHS officials did not respond to a request about the nature of the problems. However, they reiterated that wait times have been reduced or even eliminated as they continue to work to fix the system. As of Thursday, the site had received 17 million unique visitors. “If I was them, and I’m just conjecturing, I would probably come up with some manual way of saying, ‘Only people with the last name starting with ‘A’ can sign up today,” he said. But come March 31, when the first enrollment period ends, the “shore up” period may become a “re-architecting” period, Kim said. Clearing the cache, which has helped make it easier for some people to enroll, could ultimately strain the system more, Kim said. That’s because a “cookie” is stored on a person’s computer that contains data, such as the person’s name and address, that can then be quickly accessed when that person gets on the website again instead of having to be retrieved from the government’s server. But as HHS fixes errors, the cookies may not correspond with the updated website, so rather than allowing someone to quickly log in, they instead cause an error message. And every time a person clears his computer’s cache, the government’s website has to work that much harder to grab more data. Requiring people who may not be Web savvy to use the site in any way other than a step-by-step easy process defeats the point of the whole system, Schuyler said. That includes laws mandating that insurers provide clear explanations about policies to people may make sound decisions and understand what they’re buying. “Most consumers will have no idea what ‘clearing the cache’ is and this will just cause more confusion and frustration,” he said. So far, the site’s problems have not driven away potential customers, according to a poll conducted by uSamp — United Sample Inc. The survey found that among the 832 people who attempted to log in, 38% received an error message, 50% were asked to try again later, 25% were unable to create an account, 31% were told the system was down, and 19% had no problems. About 83% said they would try again later, while 15% said they would wait until they heard the website was working well. About 70% of those who said they had no issues said they still waited to enroll because they want to think about their options. Engates said he believes most of the problems are caused by systems integration with other sites, such as the IRS. And that could be causing some of the problems people see as they make it past the initial application process. It’s a series of questions meant to verify a person’s identity and income. But after that questionnaire, visitors often encounter a series of error messages, or the page a person tries to click to doesn’t come up. The data requests to other sites could be causing those problems, Engates said, which would mean the problem isn’t with the HHS site itself. And as they try to fix those problems, there’s another issue lurking in the background: Some HHS personnel were named essential, and not subject to furloughs because of the government shutdown. But that didn’t apply to the other organizations they were working with, Engates said. So as HHS techs work around the clock to fix the problems, IRS techs may be prohibited from working at all. In the meantime, HHS personnel can’t say anything about the situation, it can be played politically as “bad,” he said. If they say it will take two weeks to fix, they will be criticized because it’s taking too long. But he expects that it’s a problem that will be resolved soon, especially as the volume of visitors goes down.